← Never Let A Late Start Get The Better Of You! Good Morning and welcome to the latest edition of What I Ate Wednesday!! Do I sound like a game show host?! Not that I want to but what the Heck! Wednesday is the happiest day of the week around here. Why? Because the delightful Jenn over at Peas & Crayons brings us all together each week for all of this fun! Don’t forget to stroll over there and see all of the wonderful food and be sure to leave some comments! How about some food? Ok by me! 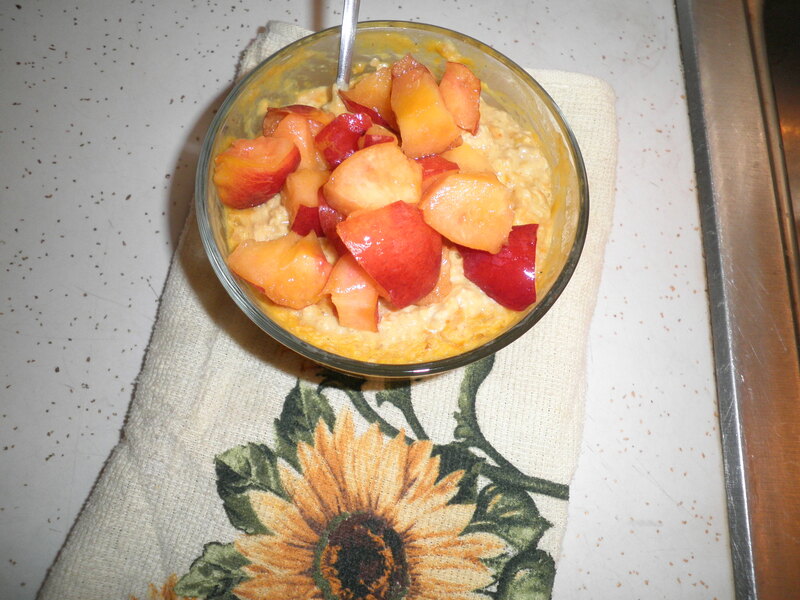 Overnight oats with Spiru-tein tropical fruit flavor mixed in and a nectarine on top…So Good! This salad looks a lot like my usual ones. But I was finishing up some celery and it was SO crunchy that it took me over an hour to eat it! I love a meal like that…the longer it takes me to eat it, the less likely I am to need a snack! 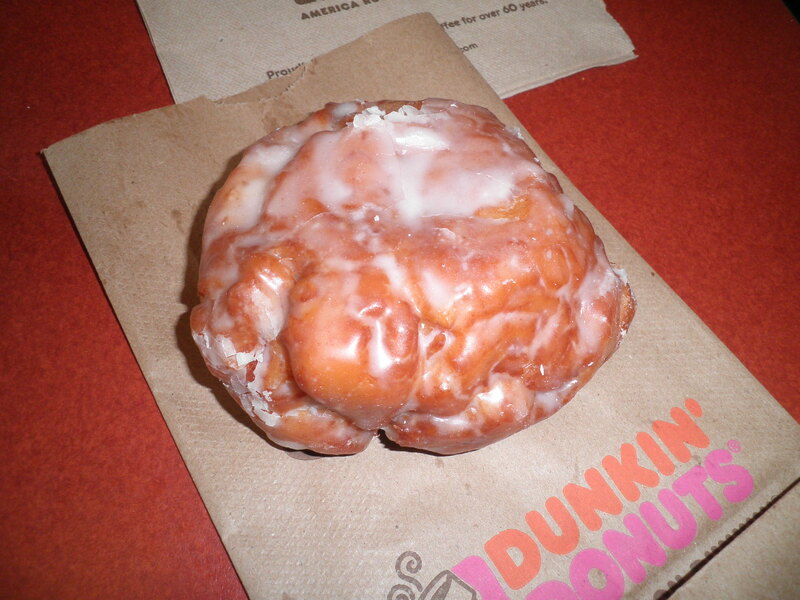 Over the weekend, Ralph and I went to Dunkin’ Donuts for breakfast. 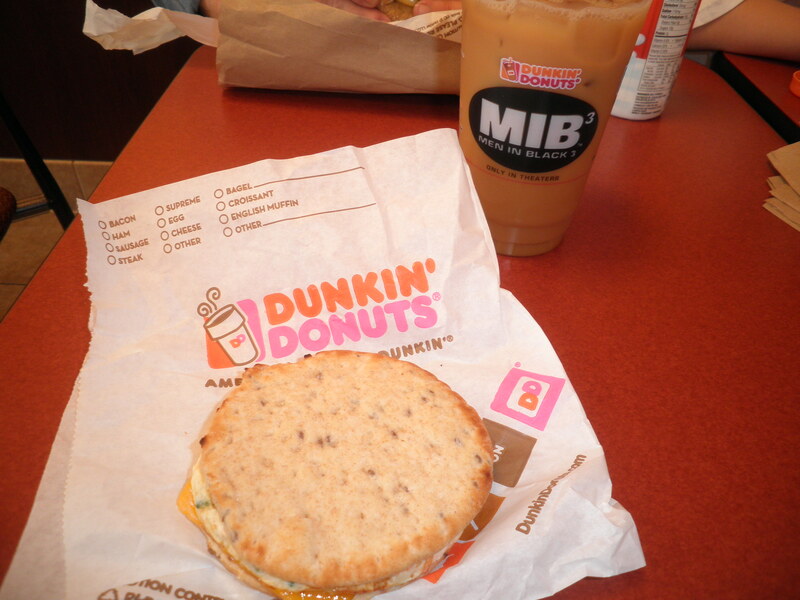 Had my usual fav…iced coffee and the veggie and egg flatbread sandwich. So good! However, I have to confess…. 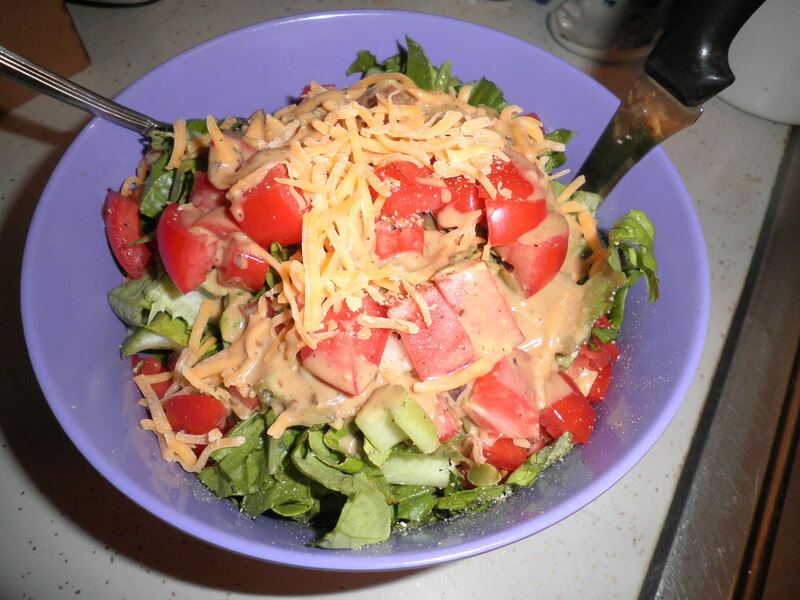 Another salad in the lovely Big Purple Bowl! This one had Morningstar Farms Veggie burger cooked up and added in. Yummy!! That’s about it for food photos this week…it’s not that I’m not eating…just not taking many photos. Trust me, I’ll be overloading you with food photos when we’re on our trip which is less than 2 weeks away!!! I’m so excited! I’m so behind!! We’ll see how well I stay on track then!! That’s WIAW for me this week. Hope you’ve all had a good week. Be sure to scurry over to Peas & Crayons to take a look around and remember to leave a comment! It’s such fun…you’ll never know if you don’t try. This entry was posted in Uncategorized and tagged exercise, salads, Ultimate Blog Challenge, walking, WIAW. Bookmark the permalink. Wow – all that food looks so good! Thanks, Dannii…not as much as usual. Don’t know why I haven’t been taking food photos. I keep forgetting! happy walking, fran! that is awesome that it feels like such a part of your regular day, now…that is great! today is walking wednesday up here in waterloo, too – at the store, we are hosting our annual 20 minute challenge to encourage everyone to be active for 20 minutes. we give away free hats and have juice and snack bars after…i think it’s to be sunny this eve so we should have a good turn out! that so exciting that your trip is less than two weeks away now! Cathy, do you think if I started walking now I could be there in time for juice and snack bars this evening?! 😉 Wish I could! Oh, lordy…I do need to get myself in gear for the trip!! Yikes!! I hope all of the “last minute” preparations for your trip are falling into place and keep on walking! I’ve been hiking a lot and love it! I’m trying to get things ready, Stacie! It’s a long time to be away so lots of things need to get accomplished. I’m getting there though and I AM Walking!! I love your big purple bowl salads! Thanks! That bowl if my Fave!! 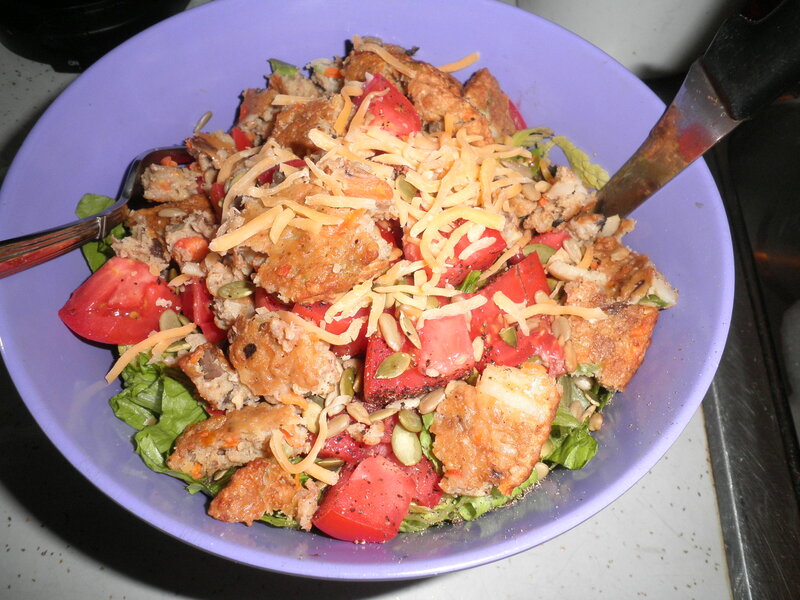 It makes a really big salad which is what I like! Love the overnight oats. I’ve been meaning to try that. What’s your favorite? Hi Marisa! My favorite is what ever I have on hand. I need to get more protein powder to add, but I’m pretty simple 1/2 cup oats, 1/3 cup ff vanilla yogurt, 1/2 cup almond milk. Sometimes chia seeds and whatever fruit I might have. Sometimes I do 1/4 cup oats and 1/4 cup oat bran. That’s good too! Hi Rach! Thanks for stopping by! I want my salads to last as long as possible! Please visit again! I had to laugh at your over-an-hour-to-eat-it salad. That’s exactly why I DON’T like salads! I’m impulsive and impatient. All that chewing bores me. Ha! Walking 2 miles a day is impressive, Fran. I walk a lot, but I’m pretty sure my walks aren’t 2 miles. Stephanie, my Sweet~ Glad to hear from you! I like salads for that reason. The longer I eat my real food, the less chance I’ll snack on something dangerous! Sadly, I think I miscalulated and it’s not 2 miles. 😦 I have to fess up today about it. I honestly thought it was 2 miles. I’m sad. Hope you’re well!! i still think it is amazing that dunkin’ doughnuts has healthy breakfast options. i love that the trend is spreading! Lol!! I take a really long time to eat big salads too!! It’s like an athletic challenge for me!! Haha.